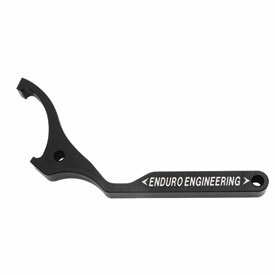 At last a spanner wrench that makes adjusting your KTM/PDS shock a breeze. Designed to loosen or tighten the shock adjusting collar without having to get out that damaging punch. Wrench works great as expected. I had some old wrenches around that didnt quite work so i had to order this one. adjusting the shock was easy with this wrench. This definitely helped getting in there and not banging up that stupid plastic that KTM uses. I wish they used metal so a punch could be used but plastic just deforms so bad so I bought this and works a lot better. Makes sag setting a lot easier, works as intended. what was I doing before?? Why did I use a punch or awkward spanners to adjust my shock, this tool is amazing and works well. Should have been using it for years. I dont know this existed and I am glad I bought it. Makes adjusting the sag easy. Don't be a caveman and use a hammer and punch. Unless you have your bike striped down this tool is of no use. Enduro Engineering. Man, those ladies and gents surely do know how to make stuff that works like a charm. It's almost like they can see into my mind regarding what tool would make a job easier...and they make it! Have they cracked the code on mind reading and control? I dunno. And I'll be honest and say that I don't care as long as they keep putting out 100% products like they have been. Two thumbs up! this is a must have for setting your sag. I usually just use a hammer and punch, but ktm's ring is plastic so this is necessary, also just made it a lot easier. This thing is pretty much junk. I used it a few times and now don't even bother taking it out of the tool box. It has slipped off numerous times and I end up smashing my knuckles. I went back to using a large 12" nail and ground down the tip to make it square. Fits right in to tight spaces and breaks the top lock nut free all the time. I then use my hands to turn the spring either up or down (while bike is on a stand with no weight on the rear tire) making sure the lock ring also turns and make my adjustments. Must have for shock work. Worked as intended made swapping out shock springs easy. Wish it had a longer handle but I was able to get the job done. Little slow going though. Wrench allows you to just adjust spring preload on TE300, minimal clearance with 2 stroke pipe. Every KTM should come with one. You can make adjustments without damaging the ring. Well made tool but difficult to use. The tool is very nice and well made. Unfortunately it still is not easy to adjust the spring preload ring on the KTM/Husky shocks. It really isn't the tool though. It is the amount of room you have in the frame to adjust the ring. I was better off putting the bike on the stand and using my hand to turn the the spring and ring to adjust the sag. Quality tool that works perfect. This is THE only tool to use on the WP shock spring preload ring, otherwise it could get messed up pretty easy since it's only made of plastic. Absolutely recommend this tool, it works slick! Worth every penny! This spanner wrench is great. It is well designed and is easy to make adjustments to the shock collar. The plastic ring cannot tolerate a screwdriver and hammer, so don't try. A well designed wrench that functions very well in the tight space provided by my KTM. Great looking tool with a nice finish. The billet cut on this tool is precise and does its job with no issues. This tool is great for setting sag. It is slow using it, but keeps the shock from getting thrashed from a hammer. it is a very tight fit and shock needs to be tinkered with to get it on. Everyone knows the right tool makes any job that much easier. This was so much easier then using a tap and hammer! You wont regret adding this to your tool set! This tool isn't used often. Once the sag is set, mine stays fairly static. But it sure makes the job easier (eliminates cussing) and I wouldn't have an abused nut on my shock. Helped me get the job done in a precise and well engineered way. I did not have to bang around my adjustment collars and I prefer engineered solutions over the hammer and screwdriver in those tight spaces. This makes adjusting spring preload a breeze. Fits in without removing anything and you can turn the adjustment collar in either direction without trouble. Must have on the XC models. I briefly thought about adjusting my shock with a pair of channel lock pliers, then decided to spend the 20 bucks and do it right. This is a nice little tool that works great to adjust the rear shock. I'm actually afraid of losing it size is small and flat! ), so thinking about attaching it to a chain or something (the hole is already in place) to keep better track of it. what you need to work on your rear shock. works perfectly. Fits nicely. can adjust the spring without having to take everything apart. Purchased this for my 2011 Husaberg FE390. Fits and works fine. No complaints. Quit destroying your cheap plastic KTM compression ring. I always used a screw driver and mallet to adjust my sag. I always wanted one of these, but never purchased one until now. I wish I would have purchased this with my bike...maybe my plastic compression ring would look a little fresher. Great tool Does it job. This is a perfect example of a great tool. It does one thing, but it does it perfectly every time. It is comfortable in the hand. It is the right length to get some leverage without damaging anything. If you need a wrench for your KTM or Husky this is the way to go. Save your collar nut and do it the right way. Plus you be the hero at your local track to those that don't have it. May get a free beverage out of it. Used this for adjusting spring on KTM's. I am so glad I bought this. What a piece of cake. Loosen lock screw, insert this and twist the spring. Easy as could be. I love Enduro Engineering stuff and RM is the best. Works great, same as the ktm spanner wrench or ones by other companies for a little lower price. This tool makes adjusting the spring pre-load very easy with the shock installed. The shape and engagement of the jaw is a perfect fit for the stock shock spring collar. A reviewer mentioned that this tool should be steel. I don't think it matters, because the aluminum is fairly strong and does the job just fine. I had to change my shock this weekend and had no problems at all with the Enduro Eng product. If it was shaped a bit longer with the KTM angle, it might be even better.